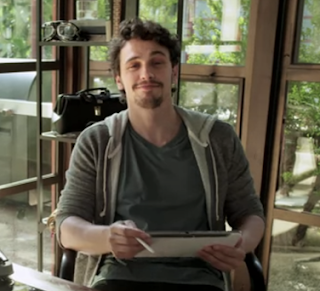 Check out this piece from The Verge about James Franco and the new Samsung Galaxy Note (Galaxy Note being BY FAR the best name I'e ever heard for a tablet). Check him out reading a "dreamily animated version" of Ginsberg's Howl. In addition to everything else he does, James Franco makes Non-Visible Art. I've got one of his pieces.